Younique Representative Ashley Ross wanted to help assist Cradling New Life families. 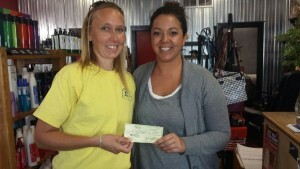 She sponsored a fundraising sales event and donated her commission check to the charity. Our work as a nonprofit depends on the support & generosity of many. With your gift, you can help lessen the financial and emotional burdens of NICU/antepartum families. There are several ways to give that will help make a difference for these families. Consider the convenience of recurring gifts or payroll deductions to help maintain assistance for NICU/ antepartum families. Create a legacy by gifting memorials, tributes, dedication, retirement & estate planning or philanthropy options. If you have questions or would like additional information, please contact us at cradlingnewlife@gmail.com.